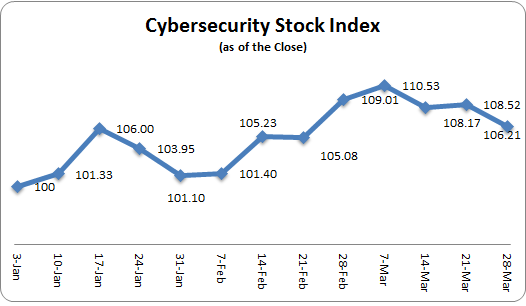 Cybersecurity-related stocks slipped at the end of March, after reaching a yearly high during the first week of the month, according to my cybersecurity stock index. As of the close on March 28, the index dipped to 106.21, down 3% from the close of 109.01 on February 28. The companies in the stock index (see the table below) still managed to beat the Nasdaq (COMP), which dropped 4% from February 28 to March 28. (Eight of the thirteen companies in the index trade on the Nasdaq.) But they were outperformed by the Dow Jones Industrial Average (DJIA) and the S&P 500 (SPX), both of which remained almost exactly flat for the month. The top performers for the month were AVG Technologies NV(NYSE:AVG), which jumped 23% during the month, and KEYW Holding Corp. (NASDAQ: KEYW) and Palo Alto Networks Inc. (NYSE: PANW), both of which advanced by 21%. At the bottom were Barracuda Networks Inc. (NYSE: CUDA), which declined by 13% after a major climb in February, and Symantec Corp. (NASDAQ: SYMC), which dropped 14%. Overall, though, cybersecurity stocks are still well ahead of the markets for the year, posting an index gain of 6%, compared to a 1% decline in the DJIA and a 1% uptick in both the SPX and COMP.